A few years ago, I decided to have a go at building a model of a rebuilt Merchant Navy class pacific. I had studied Keith Wilson's 'Ariel' design in back issues of 'Model Engineer' magazine and felt that this was within my capabilities. At the same time, I had the opportunity to buy a second hand set of drawings and castings from a builder who had made little progress. The package of material I received included a letter that outlined some of the known problems with the Ariel design. Some of the problems related to dimensional errors on the drawings. These were fairly obvious on close examination and not atypical of model locomotive designs. However, other known problems related to the design of the outside brackets which are to the West Country pattern on the Ariel design, rather than the correct Merchant Navy pattern. At the time, I did not know if this difference was significant. However, researching this error has led me to review the design of all the brackets and stretchers for the rebuilt Merchant Navy type, and produce CAD drawings to facilitate their fabrication using the tab and slot method. This article summarises the results of my research. Compared to the Merchant Navy Class, the West Country Class has cylinders with smaller bore but the same stroke. The bogie, driving wheel diameter and driving wheel spacings are the same in the two classes. However, the firebox of the Merchant Navy is almost 1 ft longer than that on the West Country, requiring a bissell truck also 1 ft longer. The knock-on effect of the bigger firebox is that the brake-hangers are repositioned. Since a lot of the brackets contain brake supports, this results in all of the external brackets being significantly different between the Merchant Navy and West Country Classes. The differences become clear when the 'works' drawings for the rebuilt Merchant Navy are compared with those of the Ariel design. A further implication of the bigger Merchant Navy firebox is in the design of the bissell truck. Apart from the truck being longer on the Merchant Navy, the truck design also needs to accommodate much more lateral swing in order for the locomotive to traverse the same minimum radius curve as the West Country. The Ariel design appears to be a modified West Country with dummy castings on the outside. However, this approach introduces several major errors. In scaling up from the West Country design, the Ariel proportions are no longer correct for the Merchant Navy. A more serious error is that the longitudinal stretchers are shown as parallel on the Ariel design, whereas they should taper inwards towards the rear to allow for the increased swing of the truck. Actually, the West Country design of stretcher also has a slight taper although this is barely perceptible on the drawings. Having determined the extent of the problems with the external brackets on the Ariel design, I decided to examine the design of the internal stretchers and motion bracket. It appears that the Ariel design was based on a small drawing published in 1945 in the Railway Gazette from which a plan view could be discerned. However, detail in the third dimension is lost and the rebuild modifications were not shown. I have obtained the appropriate drawings from the National Railway Museum and these show the frame stretchers as steel castings of a considerably more complex shape that those on Ariel. There is significant curvature in the third dimension and a complex support structure for the spring hangers underneath. During the rebuilds, redundant parts of the frame stretcher between the leading and driving wheels were flame cut away. Also, extensions were welded on to half of the spring hangers to support revised sanding pipework. The drag box was also considerably more complex than shown on the Ariel drawings. The drag box and bissell beam were cast as a single piece rather than as separate components in Ariel. During the rebuild, part of the drag box supporting the boiler was cut away. 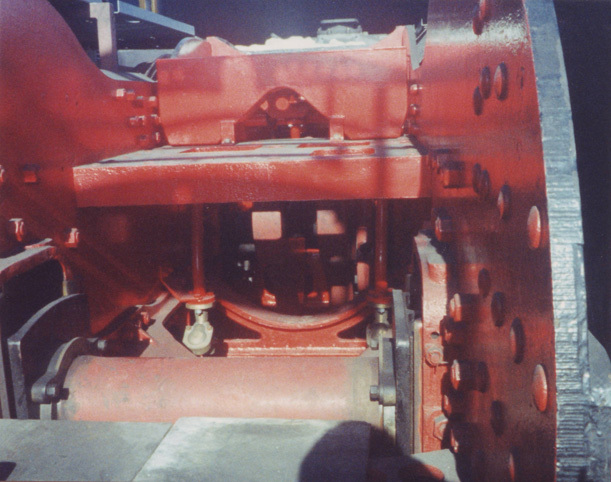 A comparison between the works drawing and the Ariel drawing for the internal motion bracket shows a different pattern of lightening holes and the boiler support pads centred on the motion bracket frame rather than the locomotive frame. My challenge was to prepare CAD drawings that would allow a fair representation of these components to be fabricated. However, it was recognised that the three batches of 10 locomotives had distinct differences. Additional lightening holes were cut in the castings in the second batch, and the patterns were modified for the third batch. The first batch of locomotives used a completely different design for the 'frame stretcher (behind driving wheel)'. The third batch was manufactured with a fabricated bissell truck, although these were exchanged with other class members during overhaul. All of these changes were reflected in the different weights of the three batches of locomotives. After rebuild, the first batch weighed 97 tons 16 cwt, the second batch 97 tons 5 cwt, and the third batch 96 tons 1 cwt. I have decided to build a model of 35023 'Holland Afrika Line' and incorporate the modifications appropriate to the third batch of locomotives. My preference was for a fabricated bissell truck, and 35023 retained its original fabricated design for most of its life. Unfortunately, it had its bissell truck replaced with the cast variety during the rebuild. However, photographic evidence shows that the fabricated variety was reinstated when AWS equipment was installed. Preparation of the CAD drawings was quite a challenge, particularly for those representing the between-frame stretchers. The brackets made for the rebuilds were easier as the works drawings showed the individual components before fabrication. However, eventually I had a set of drawings that I was happy with and with as many of the errors that I could identify eliminated. I wanted to assemble everything using the 'tab and slot' method. This would ensure that everything held together during brazing. Arranging a system of tabs and slots that allowed everything to be assembled and would keep the assembly square during fabrication was a further challenge. Eventually, I sent the drawings off to the water-jet cutters and received a large bag of bits in return. All of the fixing holes for the bracket and stretchers had been cut with a water-jet. This ensured that they were accurately located. Furthermore, the bracket frames could be used as a template for accurate drilling of the frame fixing holes. Brazing of the individual brackets and stretchers was quite straightforward. Some of the pieces required bending to shape before brazing, sometimes involving complex curves. Some further errors were identified during fabrication. However, these were generally insignificant and the CAD drawings were modified to make the correction. Assembly of each bracket generally took less than a couple of days work, involving several heats to build up the component. Detailed views of the frames from above and below are shown in the pictures, from which the general shape of the brackets and stretchers can be discerned. 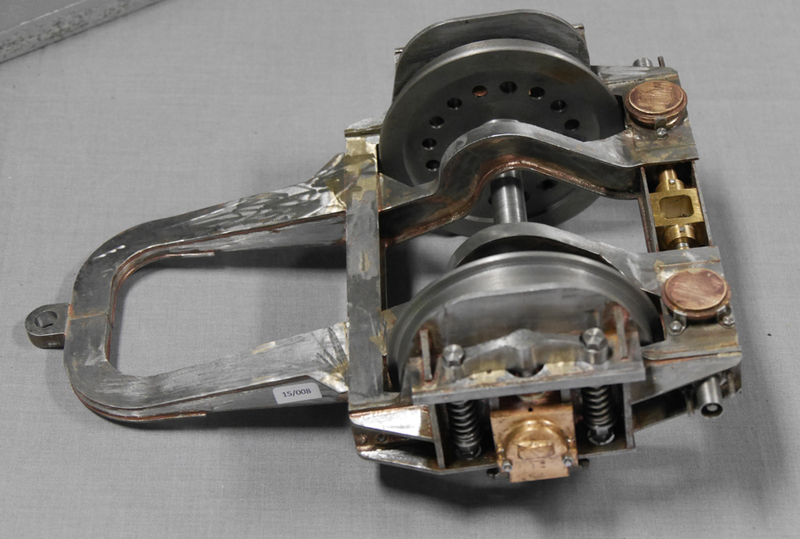 The brackets and stretchers are quite different from the Ariel design, as can be seen from the top photograph of the frame stretcher which locates behind the driving wheels. The plan view of it is similar to the general shape used in Ariel. However, the other view shows the marked curvature in the stretcher, and the structure below supporting the spring hangers. A photograph taken during restoration, which shows part of the corresponding stretcher on 35006 is shown here. This photograph also shows the different design of frame stretcher fitted to the first batch of locomotives, supporting the sand box. There is clearly a lot of work still to be done on this model. However, I feel that the work that has been done so far has produced a solid foundation for the model, with most of the errors and inaccuracies in the Ariel design resolved. 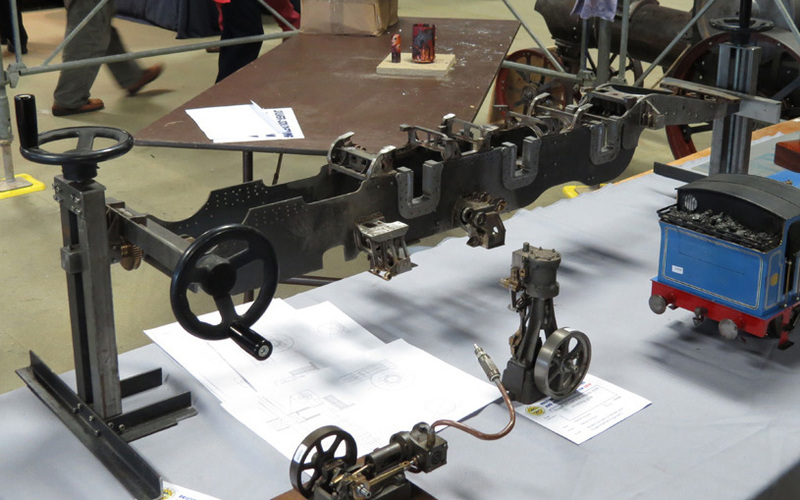 The results of the exercise were exhibited at the 2014 Bristol Model Engineering Exhibition, as shown in the photo, with the frames displayed on their building stand.